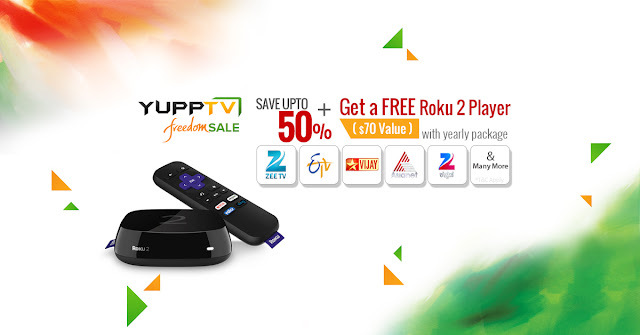 YuppTV Blog: YuppTV’s Exclusive Independence Day Sale is Fast Approaching! YuppTV’s Exclusive Independence Day Sale is Fast Approaching! One of the World’s leading providers of over the top entertainment is now more attractive and affordable than ever before! This Independence Day, YuppTV presents exclusive discounts on their unique range of entertainment packages, making it possible for everyone to enjoy the one of a kind collection of amusing South Asian content. YuppTV provides a substantial assortment of Live Indian TV Channels and cinema. Programs are available in 8 languages, including Hindi, Tamil, Telugu, Marathi, Bengali, Punjabi, Kannada, Malayalam and Oriya. Imagine having unrestricted access to the 180+channels of content, as well as a collection of top rated Indian Movies from the most popular production houses. As host to the ultimate selection of productions, you can stay up to date on the latest and greatest entertainment additions. Accessible on most internet enabled devices, you can view live TV, catch up on missed episodes, read magazines, and enjoy sensational cinema from your television, computer, set top box, smart phone, tablet, or game console. The platform is user friendly and easy to navigate, making it an ideal option for all entertainment lovers. YuppTV is available anywhere anytime, so you can stay up to date with your favorite Ethnic programs even when traveling around the globe. Committed to streaming in the highest possible quality without restriction, a YuppTV subscription offers the ultimate freedom to enjoy top entertainment without limits. With a variety of appealing YuppTV Packages available, you can choose the one that suits you best and start watching your chosen programs instantly. If you are interested in gaining access to the wealth of programming YuppTV provides, now is the best time to consider a service subscription. With the August 15th fast approaching, take a look at the YuppTV website and browse the variety of package offers in anticipation for their exciting Independence Day Freedom sale.